Tom Hanks has signed on to star in Sony Pictures’ adaptation of Richard Phillips’ memoir A Captain’s Duty: Somali Pirates, Navy SEALs, and Dangerous Days at Sea. Hanks would play Phillips, a captain of a cargo ship who gave himself over to Somali pirates in exchange for the safety of his crew. 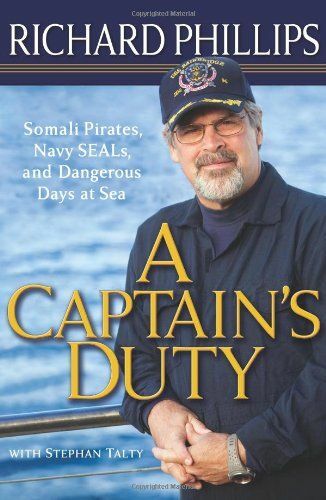 Phillips was hostage to the pirates for three days and was eventually saved by Navy SEALs who killed three of his captors and left another in custody. We reported back in 2009 that screenwriter Billy Ray (State of Play) was working on the script and Deadline reports that Hanks sparked to the latest draft. The producing team behind The Social Network (Scott Rudin, Michael De Luca, Dana Brunetti, and Kevin Spacey) will produce the adaptation of A Captain’s Duty. Hit the jump for a synopsis of the memoir and other projects on Hanks’ schedule. Hanks is currently shooting on Stephen Daldry’s adaptation of Jonathan Safran Foer’s Extremely Loud and Incredibly Close. He’s also attached to an adaptation of Cloud Atlas, Kathryn Bigelow’s Triple Frontier, and he may co-star with Tim Allen in a family film based on the Disney theme park ride “Jungle Cruise“. Hanks will next be seen in theaters in Larry Crowne, which opens July 1st. and his selfless concern for his crew. It was just another day on the job for fifty-three-year-old Richard Phillips, captain of the Maersk Alabama, the United States-flagged cargo ship which was carrying, among other things, food and agricultural materials for the World Food Program. That all changed when armed Somali pirates boarded the ship. The pirates didn’t expect the crew to fight back, nor did they expect Captain Phillips to offer himself as hostage in exchange for the safety of his crew. Thus began the tense five-day stand-off, which ended in a daring high-seas rescue when U.S. Navy SEALs opened fire and picked off three of the captors. “It never ends like this,” Captain Phillips said.